Tri City Auto Repair in Spring Lake, Michigan now sells and installs high-quality Millenium Spray on truck bedliners for small and large pick-up trucks, commercial vehicles and for various other useful applications. Sprayed directly onto your original truck bed, Millenium Liners form a permanent airtight and watertight seal that will prevent rusting. These flexible truck bedliners will stand up to the most extreme temperatures, hot or cold, yet still remain pliable. The Millenium Liner is made from a solvent-free solid that will not harm the environment or users at any time during application or once it is cured since it has very low VOC's. You can also count on our truck liners to provide the slip resistance need for hauling loads or standing in the truck bed. The textured surface makes sure your load stays put and provides the traction you need even when wet. Hauling a snowmobile with new carbide blades? No problem. The Millenium bediner is made of solid epoxy resins and Kevlar to resist scratches. The Millenium Liner may be applied up to 28 mil. thick. The chemical composition of the Millenium Liner makes it the strongest bedliner available. It is so durable that it may outlast the rest of your truck. Our truck bedliner will resist acids and alkalis such as chlorine, gasoline, diesel fuel, paint, bleach, organic solvents, fertilizers and much more. The Millenium Liner will significantly reduce road noise and vibration making your vehicle ride smoother and quieter. Plus, when you decide to sell your truck, the Millenium spray-on bedliner will increase the blue book value of your truck and make it more attractive to a potential buyer. 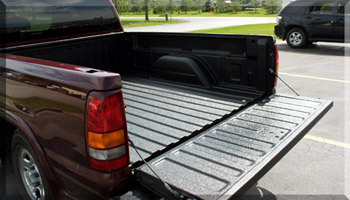 Since this quality bedliner is sprayed on, you won't lose any cargo space like you do with plastic drop-in liners. In a full size truck you can still easily haul that 4' x 8' piece of lumber or drywall. To learn how a Millenium sprayed on truck bedliner can improve your truck or commercial vehicle, contactTri City Auto Repair today or call us directly.